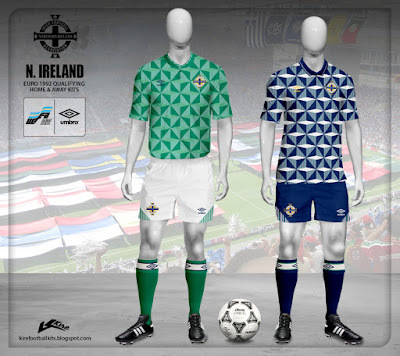 In 1990 Umbro resumed their relationship with the IFA and introduced a set of kits with a repeated geometric pattern. 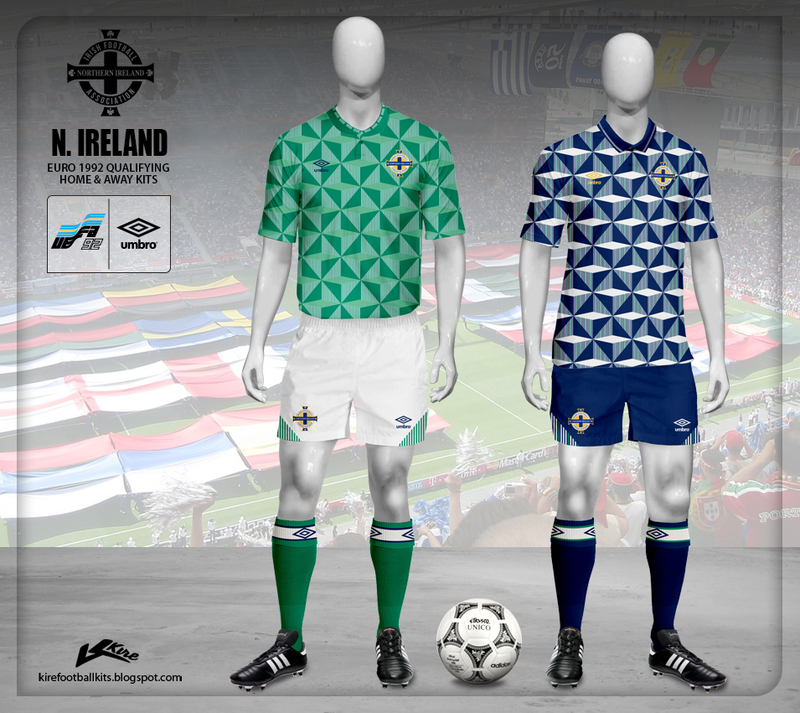 The reintroduction of navy blue to the national team's pallette was a welcome reminder of Ireland's early heritage. This umbro kit likes me because of the special neck it has, of course when compared with the revolutionary away kit, the home outfit looked positively conservative. As a funny note, numbers on home kit are different between jersey and short. Almost forget, umbro logo in home jersey have the new logo design at a time, meanwhile the rest of the logos conserve the old design. Germany team and Adidas have always had an affair, more evident in Euro 1992, Adidas always have something different for German kits, in that time was the most spectacular V neck of all mankind and another details but the neck was something awesome, when you probably think that a simple white neck with black Adidas logo is adequate...boom!. Anyway another detail was the absence of stripes in short and the sleeve stripes design of course. This adidas kits dressed USA team during the build up to the 1994 World Cup which they hosted. 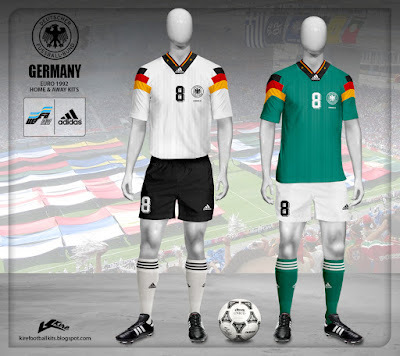 I mentioned before that this design in particularly from adidas is the best of all in my opinion, those days the German brand decided that 3 stripe concept will be his mark, even they changed logo. Man! even they asociated stripes to sport clothes since ever. 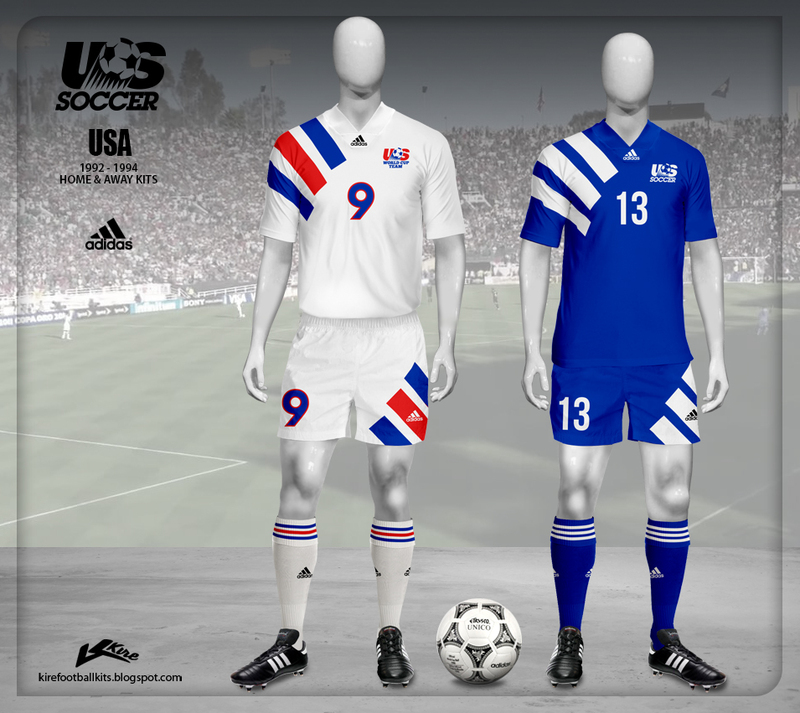 Notice that US logo and numbers are different between those kits, it's a prove that designers still missed details like this in 90's decade. And maybe a little bit of red improve away kit, don´t you think?. 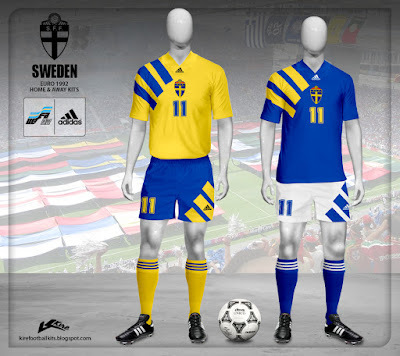 In this tournament we saw a change in design philosophy, Adidas was the leader and they were who brought that change ... no pattern fabric and a simple and impact 3 stripe graphic in jersey and shorts, a few months later socks too. Isn't greath that big 3 stripe in shoulder. The best all time adidas design in my opinion till now. The away kit don't showed up in Euro 92, but the kit was seen in friendly matches. Almost forget.. and new logo too, guess what! a big 3 stripes too.. that's branding? hell yes!! 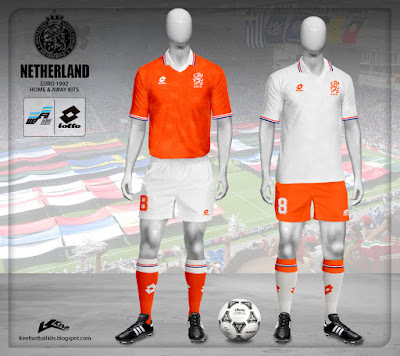 New era was for Holland team with this Lotto kit open the 90s decade, in a elegant kind of design as his counterparts Umbro, guys of italian brand sponsor one of the hottest teams in those times. The kit was popular, i guess because so many years with Adidas. 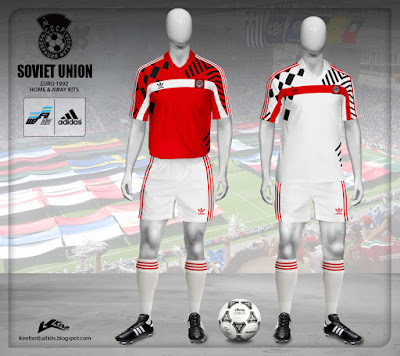 As the USSR national team had already booked a spot in Euro 1992 through the 1991 qualification tournament, the only way to preserve the spot for the post-Soviet team was to take part in the competition as a unified team. 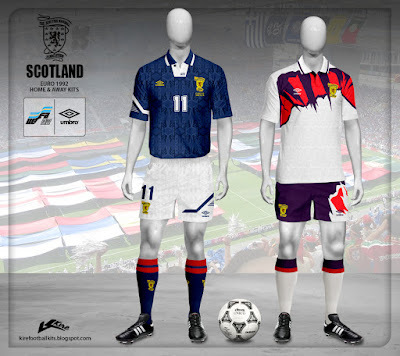 Here the kits dressed during the qualification stage, showing a crazy pattern design fashionable at the time.